Anne-Laure Chamouleau has a vast experience in representing French-speaking clients, individuals such as companies and is specialized in Spanish real estate law, inheritance law and litigation within an international scope. By holding law degrees from France and Spain and through her knowledge of both the French and the Spanish culture, she is of great value for the firm’s French clients. 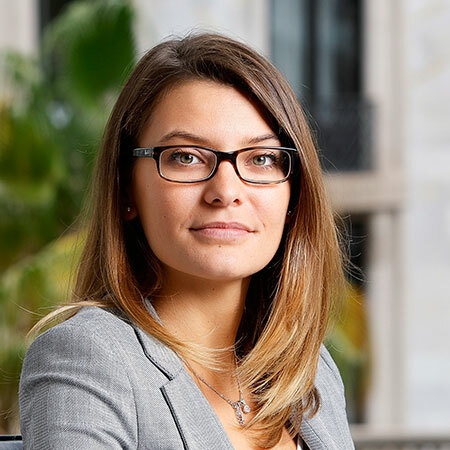 Anne-Laure was born in Soyaux (France) and graduated from the universities of Poitiers and Barcelona and holds a Master’s degree in property law from the University of Poitiers. She is a member of the Barcelona Bar Association. Before joining the firm, she worked as an attorney for Cabray Abogados, Fidal Abogados and Légier/Lozié/Gervais de Lafond in Angouleme (France) as well as for the Notary’s office of Rumeau in Champniers (France). Anne Laure is passionate about travelling and getting to know different cultures. That’s why she decided to leave France and head for Spain. She is very perfectionist, curious and quite restless. Because of that, she is constantly seeking training and wants to learn new things. During her free-time she enjoys getaways to nature.